Choosing where to set up a small business is incredibly important to the success of the business. A good location for a fashion boutique should be affordable, visible and have good rental terms. Generally, the type of good or service offered by a store usually has the most influence on where a store is best fit to be located. For example, a shop selling specialty goods will be visited by customers who would not mind going the extra distance to buy a unique product. A fashion boutique, on the other hand, would be selling jewelry, stylish clothes and other luxury items. It is then warranted for the fashion boutique be located in a shopping store preferably around other fashion boutiques as customers of these products would most probably want to compare prices before making a purchase. The fashion district, located between the intersection of Bathurst Street, Queen Street West to Spadina Avenue and King Street in downtown Toronto would be an ideal location to open a fashion boutique, but we will explore more options below. Idyllic rental property for a fashion boutique can be found in many places outside the garment district in Toronto. There are a few fundamental questions you need to ask yourself concerning the fashion boutique that will help you come up with the perfect location. Some of these questions are; who are your customers? What kind of space would you need? How many people walk or drive past that location? These are questions that ICC Property Management can assist you in answering, as well as finding the right property. A rental property near a large mall or store may benefit a fashion boutique. Besides getting the right location, the other main consideration to make is with regard to the location cost. You should seek to work out the property tax and who will pay for it, additional marketing cost if the location is remote, maintenance costs, utility costs and so on. Other considerations to make in finding the right rental property in Toronto are the provision of special lighting or fixtures that may be needed in a fashion boutique, availability for dressing rooms, sanitation, parking etcetera. The right location decision could mean a fortune for the fashion boutique and its future. A decision such as this should thereby not be rushed. A property management firm would aid in finding just the right rental space. Toronto real estate has been on a recent boom and finding a commercial space for a fashion boutique may pose quite a challenge. Soliciting the services of a property management firm would make quick work of the mountain of work it would take to secure the right rental spot. First, property managers can do the research related to finding the location such as obtaining location demographics from various sources including their own database. A real estate agent can do the footwork needed and negotiate fair fees and pricing for the rental. ICC Property Management is one of the best property management firms in the city that would help you get the right rental property in Toronto. Sump Pump And Possible Problems How To Fix It? There are four basic needs any human requires: food, water, clothes, and shelter. Each is essential for survival, and thus must be valued and protected. Sump pumps prevent flooding in the basements of houses, human shelters. But as with all man-made contraptions, there are downfalls to the system. Sump pumps have some issues that need to be sorted out. Switch problems, power outages, frozen pipes, improper installation, size, lack of maintenance, and product defects are all major contributors. The first common issue is switch failure due to jostling of the sump pump. Sump pumps can sit in a hole, therefore the hole must be large enough to accommodate the machine. The problem we run into, however, is that the sump pump jostles against the side of the hole and gets stuck. When the lever gets stuck it fails to work and the basement floods. This has happened on several occasions in my very own household. Changing the size of the hole will not change anything, the lever will still have the ability to get stuck. What would be beneficial would be a method to secure the sump pump into place. Some contraption as simple as a rope or as complex as an extra attachment on the machine would suffice. Just create something to keep the sump pump stationary when in use and the problem will be solved. Another issue that occurs is that of power outages. 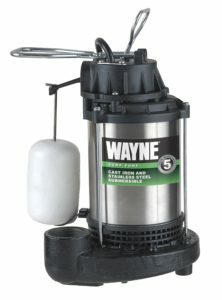 If the sump pump is connected to the main circuit for the house, a power outage would render the sump pump useless. So in order to prevent that from happening the sump pump should be hooked up to a backup generator. Or, solar panels with batteries to maintain working order during the night would work just as efficiently. Just recently the power went out in my town and I had to deal with this very problem. Luckily for me, I have a generator, and thus know first-hand how this problem can be solved. Problems do not always come directly from the sump pump, however. A frozen or clogged discharge line can be just as disastrous. In order to keep the discharge pipe protected from freezing and debris the exit point should be covered by something. A special grated discharge line attachment could help, not to mention the ability it would also have to keep out unwanted animals. Some discharge lines, like mine, run not just out of the house but far across the yard. That offers greater risk to freezing. The best solution for that, in my eyes, is to make sure the pipe runs deep enough underground that freezing is a negligible factor. Improper installation is a big issue for people like me, who only are good at cooking macaroni and cheese. Any number of things could go wrong just by the misreading of a word or lack of comprehension. So in my case, I would suggest reaching out to someone who has installed a sump pump before. Or simply call a professional and let them deal with it all. But for the people who actually know what they are doing in this world, they should start by placing the sump pump in anything but dirt or gravel. Dirt and gravel can cause debris to interfere with the pump by messing up the switch or float arm. Also, a check valve should be installed on the discharge line to prevent the back-flow of water unscrewing the motor shaft. An air relief hole should be drilled between the check valve and the pump as well. It is intended to prevent the pump having to overcome the air pressure in the discharge pipe. Yet another common issue is the simple problem of pump size. Size should not really matter much, but in some rare cases it can be important. Too big of a pump can result in a shorter lifespan due to the fact the pump has to work harder. But a pump too small might not be able to pump the water efficiently, once again resulting in a shorter lifespan. There is a simple solution, though, for this rather simple issue. Measure the hole you plan to put the sump pump in and acquire the correct size. It is an easy fix and necessary to ensure a useful pump. The next issue is that of lack of maintenance. Everything in life needs to be maintained. Just as people work out to remain fit or get their oil changed in their car, sump pumps require continuous care. Without maintenance, any one of the previously listed problems can occur. It is perhaps one of the most important tasks that should be undertaken when using a sump pump. My resources- which are the internet, my not-so-helpful father, and first-hand experience- suggest running the sump pump every two to three months. That makes sure it is in working order, and running the back-up generator would be a good idea as well. Checking to make sure the sump pump is actually dispensing water outside is helpful too. Also, it would be wise to replace the battery on the back-up sump pump every two to three years. I solidly recommend just checking every single piece of the sump pump, back-up sump pump, generator, and back-up generator. It is better to be safe than sorry. Finally, the last problem I will touch upon here is product defect. We all know that anything can be messed up. Sump pumps are man-made contraptions and it is common knowledge that man is fallible. Therefore, it should be common practice to expect mistakes and be on the look-out for them. This is as easy as testing the sump pump when you first receive it. That way you can check to make sure everything is in working order and immediately know if there are any problems. It would save a lot of time and hassle. Another little tidbit I personally suggest would be to reach out to the company making the sump pumps and let them know what went wrong. That gives them a basis to go off of and helps future customers down the road. It is a win-win for everyone. Well there you have it, my view on the faults and solutions of sump pumps. I actually have greater knowledge of sump pumps and how they work than I did before. Hopefully this has been as helpful to you as it was to me. Sump pumps, while being one of the most annoyingly noisy things on Earth, are extremely useful in the household. Yet usefulness only goes as far as quality, so ensuring a strong sump pump is ensuring a strong shelter. That combination enables us to complete one of the basic human needs.